Over the last two years of flight instructing - mostly full-time - I've occasionally thought to myself, "I really ought to document this tidbit, so that I'll remember it later... and so that other pilots can read about it." I can't take credit for most of this stuff, because I just pass along what I've been taught. As such, I've tried to give credit for the original information wherever possible. For the most part, the "Instructor's Corner" files are bits and pieces you may or may not have commonly heard in the course of your pilot training. They range across all areas of general aviation, fixed-wing and helicopters, without distinction. You won't find anything related to turbojet operations and such, but spins, tailwheel, multi-engine, commercial, and type-specific training (i.e. Cirrus, Twin Comanche) are all thrown together with absolutely no order, rhyme, or reason. Think of it as an instructor's scratchpad. If you have any comments or questions, please send them to me and I'll answer them on this website. The email address is ryan@fergworld.com. With winter's claws cutting deeply into GA pilots' lives this January, I think this topic is appropriate. I found an interesting discussion at an online aviation forum recently about tailplane stalls. A tailplane stall occurs when the horizontal stabilizer/stabilator (or what have you) accumulates enough ice to sufficiently interfere with the airfoil's aerodynamic properties to the point that said airfoil exceeds its critical angle of attack. Basically, it's the same thing that happens when the wing stalls, except for one important fact. The tailplane's lift is directed opposite that of the wing... which means that when it stalls, it rises. Since an airplane must rotate around its center of gravity, it is a logical deduction that when the tailplane rises, the nose drops. 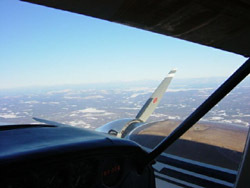 Recovering from a tailplane stall involves a technique that is exactly opposite what most pilots have learned: pitch up, reduce power, and retract the flaps if they're extended. How can you tell a tailplane stall apart from a wing stall? Buffet in the control column - not in the airframe, like you'd feel with a traditional wing stall. "Ice Folklore", at AOPA's ASF site. NASA's Aircraft Icing On-line Courses & Resources. Simply awesome. Flaps up, gear up, ... ? It has come to my attention that at least one local multiengine training provider is advocating a seemingly peculiar technique. Feathered propeller. At this altitude, it would be appropriate to troubleshoot first. As any piston multi-engine pilot should know, the proper sequence in the event of an engine failure in-flight and above Vyse is as follows: maximize power (mixtures, props, throttles); minimize drags (flaps and gear retracted); activate boost pumps if they're not already on; identify the dead engine (dead leg, dead engine), verify by moving the suspected throttle, and finally, if altitude or conditions don't warrant troubleshooting, feather. Seems this person, a competent multi-engine pilot who was simply seeking a checkout in the Seneca I, was taught by an accelerated training school to skip the fuel pump step. I.e., everything forward, everything up, identify, verify, feather. Their reasoning, according to this pilot, is that activation of fuel pumps should occur only during the troubleshooting phase... because it's an attempt to troubleshoot the problem, not a "power-up/clean-up" item. All right. Let's play this scenario out: on takeoff, the critical engine (if the airplane is not equipped with counterrotating props) cuts out at 400 feet AGL. Conditions: hot day, max gross weight. (You can always count on an engine failure occurring under the worst possible conditions - it's murphy's law.) Going by the book, the pilot decides to quickly identify and feather the prop on the offending engine without first activating the fuel pumps (which should have been "on" per the checklist, by the way, but this is a commonly forgotten pre-takeoff item.) The pilot finds that she's unable to maintain altitude due to the high density altitude and is forced to land in a nearby field, substantially damaging the airplane and causing minor injuries only (thank goodness!) to the occupants. The NTSB shows up and finds the boost pumps in the "off" position. Further investigation reveals that the left engine's mechanical fuel pump was the cause of the engine failure. That'd leave this unfortunate pilot in a bit of a sticky wicket, as the Brits like to say. The failure to flip one switch turned what would have been a non-event into a near disaster. I'd call it "bad training." Activating the fuel pumps - or verifying that the switches are in the "on" position - when dealing with an OEI situation at low or high altitude is an important and necessary step. One of my favorite scenarios to run in Air Orlando's full motion "MOTUS" sim, and its hyper-realistic Seneca model, is the failure of an engine driven fuel pump one knot above blue line. If the pilot correctly activates the fuel pumps, as he/she's been taught, the engine will quickly return to life and the emergency can be cancelled. This is impossible to simulate in a real airplane. We must all remember to train like we fight, and fight like we train. A subject I've always found very interesting is the so-called "Impossible Turn" back to the airport runway. All pilots have been taught, at some point in their training, to handle an engine failure on upwind/crosswind as follows: pitch for best glide speed, make shallow turns, and choose a landing site within thirty degrees of the current heading. This assumes an altitude of 1,000 AGL or below. In many, if not most cases in which pilots experience a low-altitude engine failure upon departure, this is good procedure. I advocate it and teach it, particularly to newer or lower-time pilots. This sort of emergency can be quite stressful for the pilot, and the training must reflect the pilot's often-reduced capacity for performance by using a simple and frequently practiced procedure. However, what if the airport you're departing from is surrounding by a dense urban landscape... ? (Like TEB, Teterboro, NY) Or, completely inhospitable terrain (i.e. TEX, Telluride, CO)? Above certain altitudes, wouldn't you at least consider turning back to the airport in your pre-takeoff calculations? There are a number of reasons why trying to turn back is often not a good idea, chief among them the possibility of a stall-spin accident. When you're slow and low at a high angle of attack, trying to turn back to the airport can be extremely hazardous. I'll be blunt: if you contact the ground out of control and descending vertically in a spin, your chance of survivial is a flea's hair more than zero. If you contact the ground under control, even if you strike obstacles on the way down, your odds of survival are a lot better - depending on exactly what you hit. But, sometimes turning back really is the best option. There are two things I'd like you to do. First, read Professor David Rogers' 1991 study called "The Possible Impossible Turn. It is located here, in the EAA Vintage Aircraft Chapter 7 newsletter, starting on page 4. Second, browse through Professor Rogers' voluminous data on the subject, particularly starting on the end of page 4, the "Optimum Bank Angle". You needn't pay too much attention to the formulae, just the findings. I'll grab an ice-cold Diet Pepsi from the fridge while you do that. You're a thorough reader. You understand the caveats. You understand that if better options exist, that they should be taken first before attempting a turnback to the runway. You understand that this takes judgement, planning prior to takeoff, and most importantly, training to get it right. You also understand that this needs to be practiced... with a competent instructor. In other words, the FIRST time you attempt to employ these techniques should NOT be when your engine fails at low altitude on departure! The average pilot's chances of getting it right the first time are pretty darn slim, and the mind's just not typically capable of advanced performance under that kind of pressure. In short, and I can't say this enough, this has to be PRACTICED! Your reaction should be automatic. Muscle memory should play a role in the proper execution of this technique. Getting it wrong has very significant consequences - the worst is a stall spin accident at low altitude, which would almost certainly be fatal. So, on to the practical. It so happens I do teach this maneuver, both at altitude and on takeoff. My belief is that if you practice the "possible impossible turn" at low altitude, a reasonable safety margin must always exist to make the airport safely in the event that the engine truly does decide to take a nap. That being said, performance also varies signficantly between different single engine airplanes. For example, out of all the airplanes I fly, the Piper Arrow probably has the worst glide performance (despite being a retractable gear airplane!) Altitudes at which you'll find the turback can be successfully completed may range anywhere between 1,000 feet AGL and - gulp - 500 feet AGL. It's time for me to wax poetic on another topic, the crosswind turn. The AIM (4-3-3) recommends: "...If remaining in the traffic pattern, commence turn to crosswind leg beyond the departure end of the runway within 300 feet of pattern altitude." Some folks interpret this to mean waiting until at least 700 feet AGL to make the crosswind turn, assuming a 1000 AGL TPA (traffic pattern altitude.) If you're flying a twin, I'd certainly agree to keep things stabilized a little longer, and to fly a slightly larger pattern. But in the average piston single -- and assuming you're not extending to allow traffic on the downwind to pass abeam -- why wait so long? Why not 500 feet? Occasionally, why not less? Here's what remaining on the upwind until 700+ feet AGL does for you. Increases your distance from the airport so that, in the event of an emergency, a known "safe haven" will be further away than if the crosswind turn had already been made. Increase the necessary turn back to the airport from a potential 90-120 degrees to 180-210 degrees. And just think of how far you might travel in that extra few hundred feet of climb. If you're climbing at 500 feet per minute - quite a common number for many single-engine airplanes - that's almost 30 seconds. At 60 knots ground speed, you're travelling an additional 2,500+ feet horizontal distance away from the airport. That's pretty close to half a mile, which can make all the difference. That extra few hundred feet on the upwind can be quite costly! You can always ask for an early turnout in the pattern, if you're flying at a controlled airport and feel that a 500 foot turn is just too early. I demonstrated this to the new owner of a Cirrus SR-22 in the traffic pattern at Venice, FL. On the first attempt, I instructed the pilot to maintain best glide speed, which is 89 KIAS, flaps retracted, and use no more than 30 degrees of bank to attempt to turn back to the airport after simulated engine failure. We initiated the simulated failure at 600 feet. Using the conditions I've just described, it was obvious after turning ninety degrees from the upwind toward the airport -- into the wind, I might add -- that reaching airport property without combustion was going to be impossible. On the second attempt, using a 40-45 degree bank angle and a ten knot buffer above stall speed, the turn was completed with time to spare. (Pitch for best glide after pointing towards the airport.) We had our choice of runway, taxiway, or grass. We would have walked away from the emergency landing without a scratch. And the airplane would have been okay, too! Now, imagine that failure occurring at 700 feet on the crosswind. Because the turn toward the airport has been reduced now to 90-120 degrees, the odds of safely landing on airport property is excellent. This is why I believe turning at 500 feet AGL is a better practice, in single engine airplanes. The key here is to remember the risk involved with increasing the bank angle and decreasing airspeed. My instruction in the Cirrus is to reduce pitch angle at the first sign of any buffet. Landing under control, your odds are good. Don't flip those odds upside down by stalling the airplane at low altitude. And don't even think about trying this without the proper instruction!